Here is a list of best free internet usage monitor software for Windows. These are perfect tools to monitor internet usage on your computer. Internet monitoring software are used to track data consumption for a given duration of time. You can also monitor real time data activity with few of these network monitoring software. Few of these internet usage monitor can show internet usage statistics on daily, weekly, and monthly basis; some also let you export report in various formats. These internet usage monitoring software are lightweight, and barely occupy space on your computer. Using these freeware can be very fruitful if you use a limited data plan, and you want to keep track of data consumption. I have compiled a list of 13 best free software to track internet usage. Along with the describing these software, I have also described how to monitor internet usage with the help of these network monitoring software. Glasswire is my favorite software to track internet usage. It not only displays the data consumed, it also displays the data consumed by various applications, proxies, etc. It also displays real time network activity. You can view daily, weekly, and monthly statistics; however, you cannot generate report. To generate report you can use another good internet usage monitor, NetWorx. You can also checkout the list of best free software to Test Internet Speed, Boost Internet, and View System Information. NetWorx is a free internet usage monitor for Windows. This software is a very useful tool to track internet usage of your computer. It keeps a record of the total data used, which includes received and sent data. It not only shows the total data transferred; you can view the data usage on hourly, daily, weekly, monthly, and custom basis. The data is displayed in numbers and graphic rendering as well. Browse through different tabs to view internet usage. The Custom Tab lets you generate a report of data usage from a given date to another. This network monitoring software has various other features as well. Go to the Users option, and view the internet usage report for a specific user. Export the internet usage report in 3 different formats: HTML, TXT, and CSV. This freeware also gives you an option to reset all the readings, and start from zero again. This is a perfect network usage monitoring software. Data usage distribution among Apps. Data usage distribution from different hosts. Data usage distribution based on Traffic type. View report for a given period of time. Apart from network monitoring, this freeware also acts as a firewall. It also notifies you whenever a new device is connected/disconnected on your network. You need to purchase Glassware to use the firewall, and network monitor; however, you can monitor internet usage for free. FreeMeter is a freeware to monitor internet usage. This internet usage monitoring software displays the internet activity in real time. The activity is displayed on a timeline based graph. The Green pattern shows the download activity, while the Red pattern displays the upload activity. The x axis of the graph scales the time, and y axis is the data size. This graph displays the network activity. To view the internet usage, right click on the graph > Utilities > Totals Log. A new window appears, which displays the download, uploaded and the total data exchange. You can view the log on daily, weekly, and monthly basis, or view the total internet usage. View the data usage in KB, MB, or GB. This is simple, yet very useful tool to track internet usage. NetMeter Evo is another free internet usage monitor for Windows. The graphical interface displays a timeline with internet usage statistics. The Red bars display the download speeds, while the Green bars display the upload speeds on the timeline. Real time download and upload statistics are displayed at the bottom of the interface. You can also view the maximum download speed on the left panel. Right click on the timeline to go to the Options. Here you can change various parameters, including display, and metric system involved. This network usage monitor hovers over the top off all applications, with a transparent display. You can change the transparency, and disable the Always on Top option. tbbMeter is a freeware to monitor internet usage. You can view your internet usage in real time. It displays the statistics like download speed, upload speed, total downloaded and uploaded data. The statistics are displayed on a timeline. X-axis is the time, and Y-axis represents speed in MBps. Click on Stats to view the total data downloaded and uploaded for the day, week, and month. The real time monitoring checks for speed each second, you can change that to various time intervals. Go to Menu for several other options. Test download speed for files of different sizes. BitMeter 2 is a free internet usage monitor available for Windows. This freeware to monitor internet usage, displays real time internet usage activity on your screen. The activity is shown on a graphical timeline. You can constantly monitor the upload and download speed. You can also view the daily, weekly, and monthly internet activity on your computer. Right click on the graph, and click on Statistics Grid, to view the total uploaded, downloaded, combined total, average upload, and download speed for the day, week, and month. Click the Hours, Days, and Months tab to view internet usage separately. Use the settings to change the scale, transparency, and other attributes of the graphical timeline. Network Activity Indicator is another simple tool to monitor internet usage. As soon as you install this internet usage monitor, it gets placed in the system tray. The icon appears in the system tray as 2 computer screens. Hover the mouse pointer over the icon to view the total uploaded and downloaded internet data for the session. Right click on the icon to open various options, like: settings, network statistics, status, properties, etc. You can view the data consumption for all the adapters installed on the computer, or just the selected ones. With the help of this feature, you can sort out the amount of data consumed for each network adapter, say WiFi, and LAN. GabNetStats can be used to monitor internet usage on your device. This lite network monitoring software displays real time internet statistics. These statistics include instantaneous upload and download speed, average upload and download speed, and total data received and sent for the session. To access statistics, run the executable file of this internet usage monitor. An icon appears on the system tray with blinking computer screens; click on the icon to view statistics. The statistics window also displays a graphical representation of data bandwidth. LanLights is a free tool to track internet usage. Apart from the total downloaded and uploaded data, this internet usage monitor also displays the real time upload and download speed. All the data is is displayed in numeric, as well as graphical values. This program gets minimized in the system tray if you close it. This internet monitor also lets you view the CPU usage, and the memory usage of your device. Bandwidth Monitor Zed is a simple internet usage monitor which displays he output on a graphical timeline. This light software shows the real time network activity on your screen. The horizontal axis of the graph is time, while the vertical axis is download speed. The red bars display the download activity, and the green bars display the upload activity. On top of the graph you can view the maximum upload and download speed. Under settings, you can change the sampling rate, and visual properties. ShaPlus Bandwidth Meter is another light and portable free software to track internet usage. The graphical interface of the software is a small box, divided into 3 sections. These 3 sections display the total internet usage for the on going session, Today, and This Month. This box floats on top of every window. You can also set transparency of this freeware. 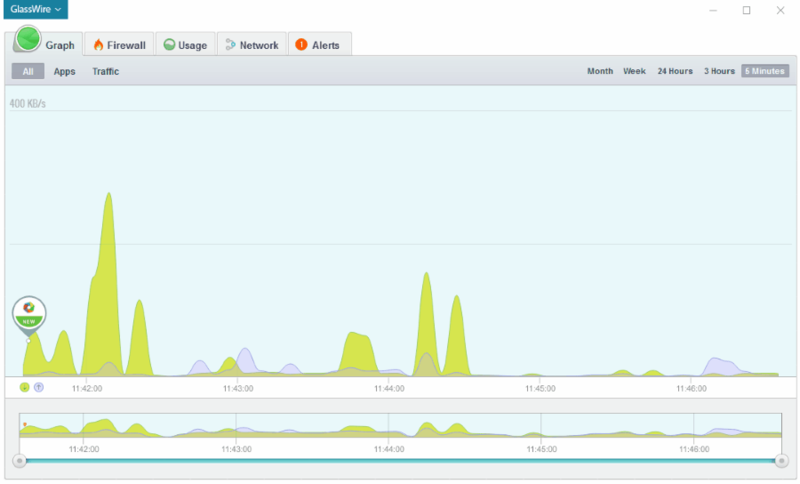 iTraffic Monitor displays real time internet usage on a timeline. Along with the bandwidth, it also displays total downloaded and uploaded data for the session, peak download and upload speed, and average download and upload speed. Right click on the UI, and click on Reports to view daily, weekly, monthly, and yearly download statistics. Go to Setup and select the network adapter from which you want to record the data transfer. You can only record internet data transfer from one source at a time. ISP Monitor is a freeware to monitor internet usage. It displays internet data statistics, such as downloaded data, uploaded data, total data, and real time download and upload speed. Go to View tab, and click on Traffic Monitor to view the real time data activity. This freeware can also be used to test the download speed of the internet. If you are unable to view the data activity, go to settings, and change the network adapter settings.